I'm so excited to share a little gift I've made for a close friend! When Taylored Expressions came out with the Faith & Hope set I knew my friend would love some cards made with the sentiments! Card sets are something she loves to receive from me but I didn't just want to hand her a bunch of cards ;) I wanted to put them IN something. So I created this little gift box. This holds 4 cards and envelopes but I'm sure you could squeeze six in there! 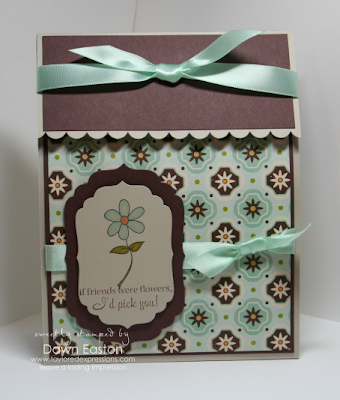 For the front of my box I used the flower from the Beary Special Accessories and also a sentiment from A Year of Sweet Sentiments. I hope that she will use the gift box for something else someday and that is why I went with a simple sentiment....which I happen to love! I am going to try to explain how I created this. 3.5 x 7.5 scored at 1/2, 1 1/2, 6, 7. Tape the small 1/2" sides to the inside of the box. I scalloped the flap edge but you can decorate it however you like. I've made four simple cards using the Faith & Hope Stamp set. Awesome job Dawn, I love it!!!!!!! THis is just AWESOME, Dawn! I have to try one of these! OOOOH! How GORGEOUS Dawn! What a wonderful set of cards for your friend and such AMAZING presentation! LOVE these girl! Dawn this is simply marvelous!! LOVE the cards and love how you packaged it !!! Seriously lovely!!! awesome!I tried making one of these with the clear boxes and it didn't sit right. 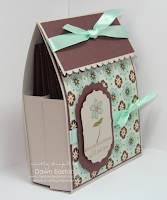 What a gorgeous project and notecards that are perfect for so many occasions. Waaaaay Awesome!! I love your box Dawn!! And your cards are gorgeous and charming!! So creative and beautiful!! Your friend will be blessed for sure!! what a great way to present the beautiful notecards! TFS!